Cogeneration plant, absorption chiller and the STULZ GE system: A well-rounded energy concept for myLoc managed IT AG and the environment. myLoc managed IT AG has three data centers in Düsseldorf covering a total surface area of 2,500 m². The company, which was established back in 1999, has been a subsidiary of Medienholding virtual minds AG since 2006, and offers its business and private customers innovative hosting solutions in the field of colocation and managed service products. The availability of its data centers is one of myLoc managed IT AG's highest priorities. In the world's largest Lampertz security room designed to LSR18.6 standards, sensitive systems from major clients such as banks, insurance companies and ISPs are protected, primarily from external influences, as a colocation arrangement. Here, more than 300 colocation customers can rely on high reliability thanks to the proactive monitoring system and the sustainable, redundant setup of all the relevant systems. myLoc managed IT AG needed to improve the crucial aspect of availability still further. In addition, it wanted the energy efficiency of the cooling system to be brought in line with the very latest standards. To this aim, the aging closed-circuit air conditioning system (without Free Cooling function) and recooling heat exchangers had to be dismantled and replaced by a completely new system. The work had to be performed during ongoing operation without jeopardizing existing data center services. The requirements for the new, fully integrated concept were, firstly, to achieve a certain independence and certainty in the calculation of energy costs that fluctuate strongly and are generally on the rise. A second objective was to be able to offer customers of myLoc the maximum possible reliability. Furthermore, impact on the environment through noise emissions had to be kept to a minimum, as the data center is situated in the residential mixed use zone of the provincial capital, Düsseldorf. The solution that meets these demanding requirements is an operator concept using local energy suppliers, the Düsseldorf public utilities. The concept incorporates electricity generation from a cogeneration plant powered by natural gas, and employs the waste heat from this plant for cooling using so-called trigeneration (combined heat and power and cooling). An arrangement of this nature sets extremely stringent demands for the air conditioning solution. Therefore, ten STULZ CyberAir3 units of the type ALD 812 GE were installed for the new data center. Each air conditioning cabinet accommodates two coils: one direct cooler in the form of a chilled water coil, and one evaporator. In normal operation, the chilled water from the absorption chiller flows through the direct cooler of the air conditioning cabinet, cooling the data center in the process. If this is not the case, e.g. due to maintenance work, each unit has its own liquid cooled chilling function with a capacity of approx. 80 kW. This way, the air conditioning cabinets can automatically take over the air conditioning of the data center without interruption, if required. 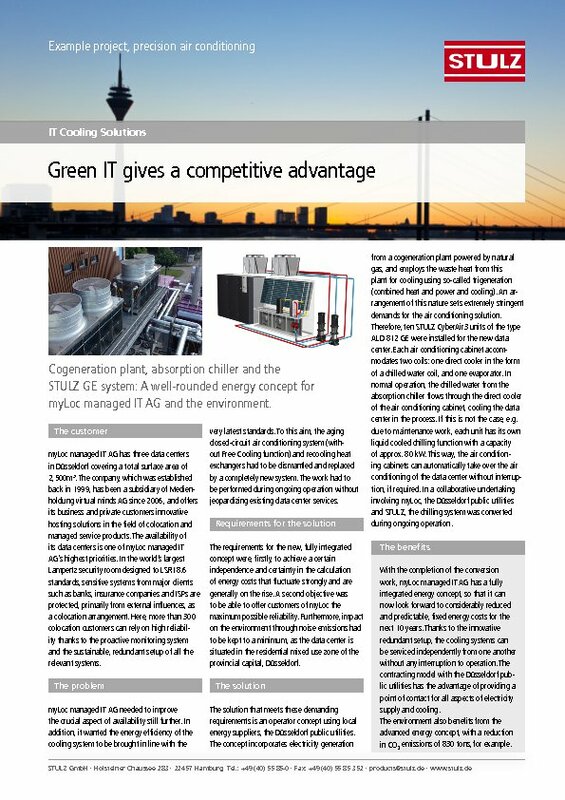 In a collaborative undertaking involving myLoc, the Düsseldorf public utilities and STULZ, the chilling system was converted during ongoing operation. With the completion of the conversion work, myLoc managed IT AG has a fully integrated energy concept, so that it can now look forward to considerably reduced and predictable, fixed energy costs for the next 10 years. Thanks to the innovative redundant setup, the cooling systems can be serviced independently from one another without any interruption to operation. The contracting model with the Düsseldorf public utilities has the advantage of providing a point of contact for all aspects of electricity supply and cooling. The environment also benefits from the advanced energy concept, with a reduction in CO2 emissions of 830 tons, for example.